Our Proud Country. Experience South Korea. Annyeonghaseyo! Do you know about saengchae? It’s a very delicious traditional Korean side dish that complements many main dishes, like beef with rice. But it’s not just a tasty side salad, it’s pretty healthy too! Do you know why the University of California, Berkeley has rated saengchae as the second best Korean food? It’s because it’s made of high-profile ingredients that are famous for packing powerful health benefits. There are many different kinds of saengchae, ranging from those containing chicken and those containing cucumber. But most kinds of saengchae are completely vegetarian. They’re all usually made with radish, red chili pepper or the paste, garlic, scallions, and sesame seeds. 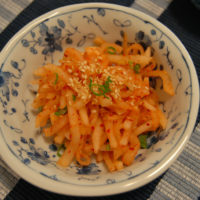 The radish is the main ingredient in saengchae. It is thinly sliced into a noodle-like form which becomes the foundation of the dish. All other ingredients season or enhance the noodle-like sliced radish. Garlic is a powerful anti-inflammatory herb that is known to cleanse your digestive system. It also boosts your immunity and protects your body with its antioxidants. Radish is low-calorie (a medium-sized radish only has 1 calorie!) and has been found to protect the liver from toxins. It’s so powerful that it’s used in traditional cultural medicines to treat poisoning. Sesame seeds have been found to boost vitamin E activity in your body, which multiplies its anti-aging, cancer-fighting, and heart healthy properties. They’ve also been found to lower pain, blood fat levels, and oxidative stress in osteoarthritis patients. Oxidative stress leads to cell damage and speeds up signs of aging. It can also cause chronic inflammation and many diseases if left unchecked for a long time. Doctors are considering supplementing with sesame seeds as a recognized therapy for osteoarthritis. Even if you don’t have osteoarthritis, sesame seeds have been found to lower your cholesterol levels. As for scallion, scientists found that including scallions in your diet protects you from colon cancer. They fed mice suffering from colon cancer a daily diet with scallions and observed that their tumor growth was suppressed and the mice lived longer. Red chili pepper is a very powerful ingredient that has recently been linked with lowering premature death by about 13 percent if you eat one or more a day. Red chili pepper is a common ingredient in traditional Korean cuisine, and not just saengchae. That may be one reason why the average lifespan of S. Koreans is around 90, whereas the lifespan of the average American is around 79. Red chili pepper has capsaicin, which has been found to prevent plaque formation in your arteries and boosts your metabolism. It makes your body burn more fat passively without you having to exercise or increase energy output. It also boosts your cardiovascular health and helps prevent stroke, atherosclerosis, and other vascular diseases. In fact, it’s so great for your heart that capsaicin patches have been found to help heart attack and stroke patients. Are you excited to make saengchae a regular part of your everyday meals? Here’s an easy recipe you can follow to make your very own homemade saengchae! Peel the radish – if you’re only making saengchae for yourself, use the outer part because it’s sweeter. Cut an appropriate amount into noodle-like strings. Squeeze any water out of the cut radish. Chop and add scallions, a few cloves of garlic, red chili pepper, sesame seeds, and any of your favorite vegetables. Mix everything well – you can add vinegar, soy sauce, sugar, and salt for added taste. Now enjoy! Ever traveled to South Carolina? I discovered your site by chance I will just say amazing!